It’s gonna get hot fast, we maybe have 2 or 3 weekends left to squeeze in some family camping time. Lucky for us, we live close to some pretty divine bodies of water that not only look gorgeous, but are also refreshing in this Texas heat, aaand, you can camp at them too! Here are the Top 5 on our wishlist for the summer. If you have any hidden gems you’d like to share, let us know! 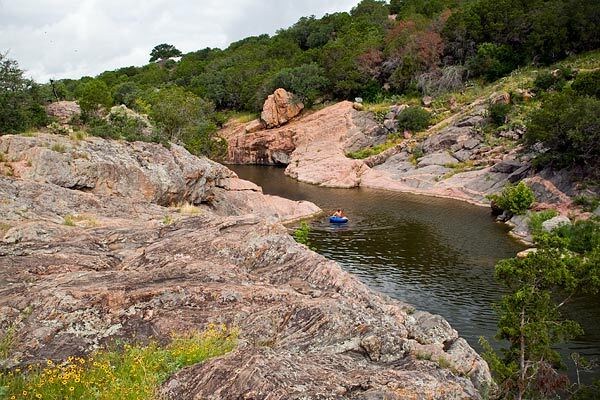 Inks Lake State Park is just over an hour away, and offers a variety of camping from primitive to sites with water and electricity with prices ranging from $10 – $22. For the camping-impaired, there are cabins available for only $50. Open year round, the park has trails, kayaking, fishing and a 9-hole golf course. Devil’s Waterhole is the popular swimming spot where you can jump off little cliffs and take in the scenery. Since Inks Lake is unaffected by drought, water-related activities will always be awesome! McKinney Falls State Park is IN Austin! The park is named after Thomas F. McKinney who once lived on the land, in fact, his homestead and horse trainer’s cabin are preserved in the park. Campsites are $15 – $24 depending on what you’re looking for. There are seven miles of trails where you can try and spot as many bird species as you can. 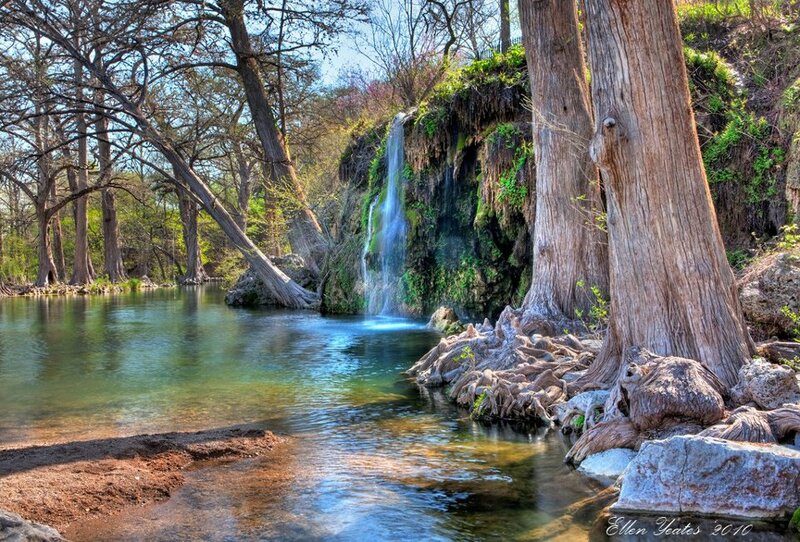 Krause Springs has been called the most beautiful swimming hole in Texas, and we’re not going to argue. Krause Springs is approximately 30 miles west of Austin and camping is only $12 for adults, $6 for kids, so there’s no reason not to check it out! The property has 32 springs and a spring-fed, man-made pool and has been privately owned by the Krause family for over 50 years. The place looks like a magical wonderland with tall trees whose roots are exposed. If a mist came rolling in, I would start looking for unicorns. 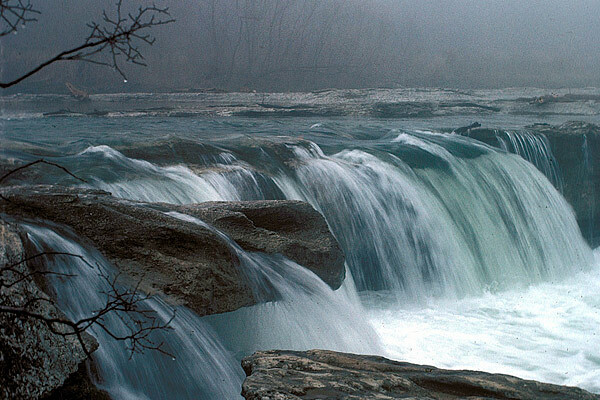 Blanco State Park is a little less than an hour west of Austin with camping ranging from $17 – $23. You can tube, kayak, fish and swim in the spring-fed Blanco River. This park claims to be the “easy start-up park” for those who are not hiking experts – like your little ones! 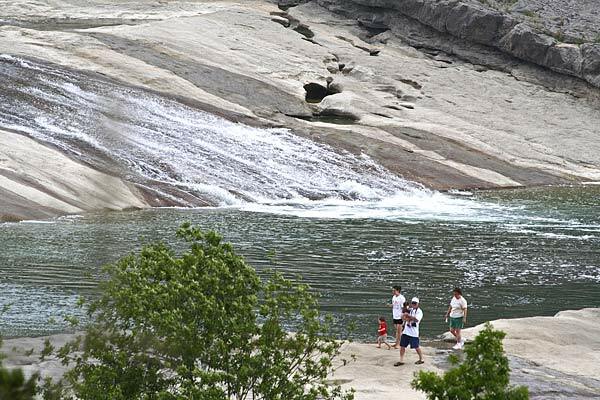 Last, but certainly not least, is Pedernales Falls State Park. The park is a favorite for family hikes. There is a duck pond that your little ones will love, as well as a scenic look over Twin Falls. Your kids will also like the wildlife-viewing stations where you can get up close with all kinds of birds and other animals. Camping is $10 for primitive sites and $20 for sites with water and electricity. Families, get packed and head out for a weekend, it will do everyone some good! Great article and photos. A lot of people think there's nowhere in Austin to go camping near the water because of the drought; but these places are doing fine. Thanks for the reminder! Thanks for the recommendations. 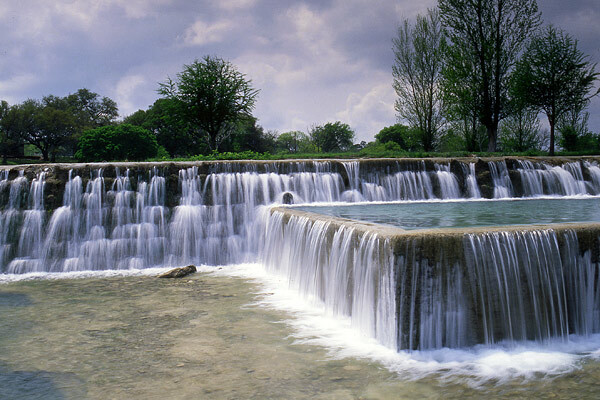 One quick note, Mckinney Falls is located in South East Austin, not 13 miles outside of Austin. We have camped at inks lake with our boys and had a great time. Nice family friemdly atmosphere witn beautiful hiking trails. Wow! Thanks for this information. I was looking for camping spots heading west via Austin and did NOT want to stay in an RV park, most don't allow tents anyway. I really appreciate your page! Thank you so much, happy camping!